This is a white on white 5x7 hinged card the way Christina taught us through her videos. I had wanted to have the edges embossed, but I didn't have a die for it, so I had an "ahhhh haaaa" moment and used my Martha Stewart small scoring tool to emboss all four sides. I used foam tape between all the layers. Also used were the Spellbinders Borderabilities A2 Scalloped Border One lace insert and Spellbinders Elegant Ovals for the gold accent in the center. 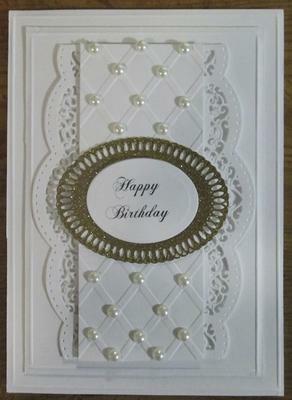 I used an A2 diamond embossing folder by Paper Studio for the center strip and embellished it with pearls. 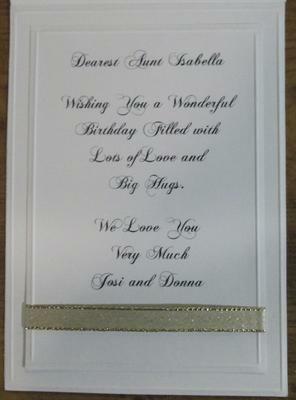 The inside is lined and the edges embossed with a gold ribbon accent. Auntie hasn't received the card yet, as her birthday isn't until next month, but I hope she likes it. I've only been making cards for about a year and a half now and am hooked, thanks to Christina. 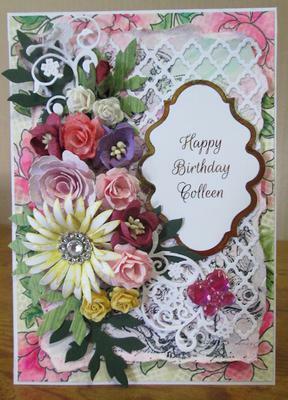 She is truly the Queen of Card-making and I am so thankful for her generosity in sharing her talent with the world. This is a birthday card I made for my Sweet Sister in September of 2014. It's a square 7 x 7 hinged card. The base is a cream. Other card stock used was white and a peach glitter paper. Spellbinder dies from the Parisian Accents and Parisian Motifs were used. I mitered the corners like Christina taught us. I used flat pearls in the corners and champagne colored stones in the other corners. I used foam tape between the peach panel and the white panel. The roses I had in my crafting stash for like… 30 years and they were the last ones! Same for the peach ribbon. I also used some of the cut outs from the dies on the sides of the card. They came in handy, so don't ever discard. My Sister really loved the card. I hope you enjoy it too. The second card Is a birthday card I made for my brother-in-law. It's an A2 size card. I used white and black card stock. The inside is lined. Spellbinders labels 20 and lattice were used. Both of these cards are lovely but I especially like the peach one as this is frilly and feminine ... just my type of card. I am sure that both recipients were delighted with them and as they had love woven into them they would be extra special. 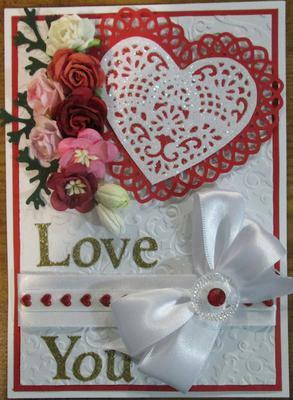 This is a hinged 5x7 "Christina Inspired", Valentine Card. I used Coordinations Cardstock from Joann's. The glitter paper I used for the lettering was from Hobby Lobby. The Spellbinders dies used were Shapeabilities Font 1 Upper & Lower Case and Shapeabilities Lace Hearts. The embossing folder was by Darice and I'm sorry I don't know the name, but it was a 5x7 folder. I just make cards for family and friends and for my own creative pleasure. This was great fun for me and I hope you Enjoy it too! The second card is an A2 card I made for my niece's (god-daughter) birthday. This Valentines Day Card is so pretty and I think you have done a wonderful job with it and you should feel very pleased with your self too. I love how you feel confident about not knowing what you are doing and that really made me laugh ... that's the best kind of confidence to have Donna. 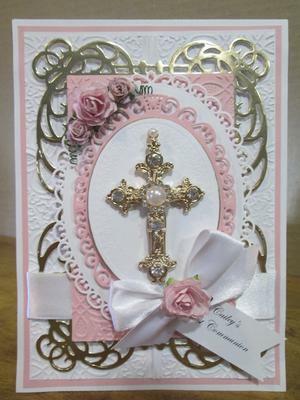 This is a 5 1/2 by 7 1/5 finished "Christina Inspired" Card for a little girls First Communion. 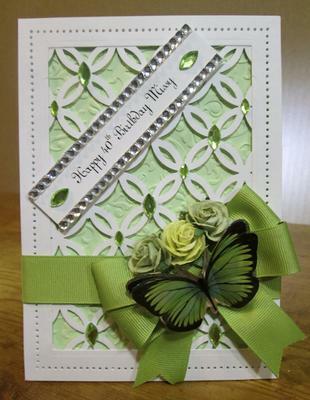 I used the Spellbinders Mystical Embrace and Elegant Ovals dies. 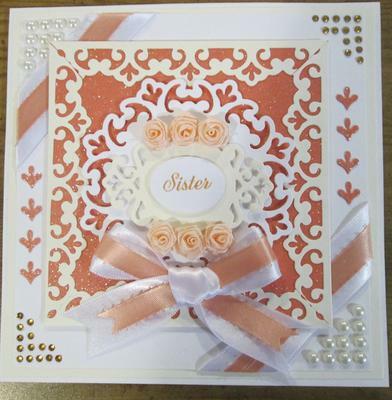 The embossing folder was Regal Braid by Anna Griffin. I knew I wanted to put a cross in the center, but didn't have a cross die. I also knew I could "make one" and use what little bits of flourishes I could find from the dies that I had to put at the points of the cross. But, I happened to be at the Hobby Lobby and I remembered Christina's video on Adding Charms to your cards and a lightbulb went on so I went to their Beading Dept. and found the cross charm. I attached it to the card with hot glue. And there is foam tape between the layers. I will make a box for it… that's on today's agenda. 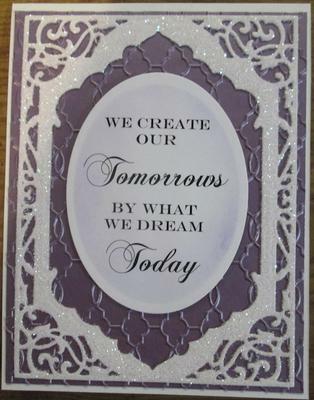 It makes me feel so happy and yet quite humble that so many of my readers take the time to send in cards as beautiful as this one and that you keep on visiting my website and my blog day after day. This Birthday Card finished is 5x7. My Sister had asked me to make a card for her to give. Don't ask me why I chose this color ... I really don't know. I'm a pink girl. Perhaps I just wanted to try something out of my comfort zone. I used a Martha Stewart border punch to make the background. I thought that turned out pretty good and was quite pleased. It's two 2 1/4 inch strips punched on both sides of the strip and then I taped them in the center. I made a frame using the Spellbinders A2 matting basics A & B dies. I had to cut the inside of the frame twice and then did some piercing. I typed the sentiment on the computer and lined it with some bling from my stash. I embossed the green card with an embossing folder. Now making the bow was interesting, because I don't have a bow maker. I viewed Christina's tutorial on how to use the bow maker several times and loved it! Then I said hmmmm….. I got out two of my color markers to use as pegs and two big clamps and clamped the markers to my craft table about two inches apart. There was my bow maker! I then just followed Christina's instructions and voila…. a pretty bow! The ribbon is from Wal-Mart and the flowers are from Wild Orchid Crafts. The butterfly is a sticker from the Dollar Tree. I was so happy with how this card turned out, I just wanted to share I hope you enjoy it too. I started making it at 7:00 p.m. and it's now 2:30 a.m.!! Clever idea with the pens to make your bow maker and I am so glad that it worked for you. The bow is lovely and it's amazing how we crafters can improvise ... such a clever bunch !! I love the card Donna and the color is so rich. I too am a pink girl but this card is simply lovely and I am sure that your sister and the person who received it are delighted with your efforts. I have been Loving Christina's "Romance" cards and, of course, was inspired to try my hand. My sister has already claimed this card to give to her friend. It's 5x7 completed. I stamped and water colored the first layer with Altenew Peony Scrolls stamp set. The second layer is attached with fun foam and I water colored the background again and then stamped with a script and a butterfly. I tore the paper all around it and curled it a little bit. 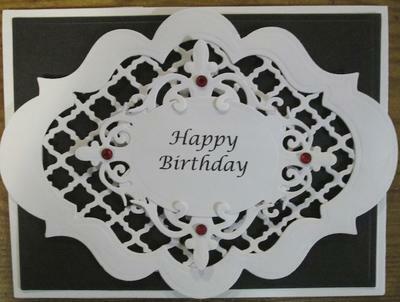 Then I cut out a Spellbinders Fancy Lattice piece and put that on top. I used the SB Labels 20 and gold foiled the edges and the sentiment. I just have a $20 Scotch laminator from Walmart and used gift wrapping tissue paper as the carrier sheet. I have some WOC Flowers, but not any larger ones, so I also used SB Bitty Blossoms and made a Rose and also their Aster Die. Oh... I also had a SB Flourish I cut out too. Now, once again, I had no clue how this was all going to turn out, but once I got it all together, I have to say I was pleased enough with it to share it with Christina. This took me all day to do and I enjoyed the process sooooo much. I hope you enjoy it as much as I enjoyed making it. Thank You Christina for all you do for us and for your wonderful inspiration. The more I see of these stylish cards the more I like them and I too really enjoy the process of putting all these things together. And many many people are also enjoying this Shabby Chic way of making them too. It is really a feminine card and the flowers make it extra special and I love that you have water colored your own individual background piece making it a real collectors item to be treasured.